Indian motorcycling has come a long way, with the turn of the 21st century bringing in a new wave of riders who wanted more from their two wheels than just ‘Fill-It-Shut-It-Forget-It.’ And in the past ten years, the game has stepped up quite a few notches. Thus, we have compiled this list of what the Indian motorcycle brands offered in 2009 and what is their best yet affordable motorcycle on sale today. Remember the good old Karizma? If one had to buy a performance motorcycle, it had to be either this or the Bajaj Pulsar 220. However, the Karizma had an engine sourced from Honda and that helped its cause greatly. Hero then split with Honda, bringing an end to one of India’s longest standing partnerships amongst motorcycle manufacturers. The Karizma stood on for quite some time with its fuel-injected fully-faired sibling, the ZMR, alongside it. The Karizma ZMR still exists although it has almost no takers today. Hero does have the Xtreme 200R which is the cheapest 200cc motorcycle on sale in India. The Xtreme offers great dynamics but sadly its motor does not live up to the same standards. Honda was one of the first manufacturers to bring in new tech of which the biggest ‘first’ was the introduction of a monoshock suspension on the Unicorn. It was one sublime motorcycle with insane levels of refinement. Its mantle as Honda’s top motorcycle was taken by the CBR250R and the quarter-litre fully faired motorcycle would still be the Japanese manufacturer’s hero product (no puns intended) had it not been for the CB300R which will be launching on 8 February. Had we done this list exactly twelve months ago, we would have just talked about how Royal Enfield has been at it with the Classic 500 and its numerous versions (limited series included). Why not, the Classic 500 had helped the company grow into a new larger dimension with Bulleteers experiencing more oomph from their ride. Yes, the Continental GT 535 was their next big motorcycle, until the 650s came along, but that did not fancy the usual crowd of RE enthusiasts. Ultimately, sales dwindled with the news of its death arriving at the end of 2017. Now they have the 650 twins and they are one of the best motorcycles to have rolled out of their stables. The Continental GT 650 is their flagship offering of the two 650 twins. Definitely Male. That’s how Bajaj pitched the Pulsar 220, one of India’s most revered performance oriented motorcycles to date, to the Indian masses. Going up against the Karizma, the Pulsar 220 was the more advanced motorcycle of the two, with a fuel-injection motor. Bajaj did revert to a carburettor for the subsequent version but their DTS-i tech turned the 220 into a winner. Their 200 twins (triplets if you consider the AS too) did take the game forward. Currently, it is the Dominar 400 which spearheads their portfolio. With racing in its core DNA, TVS launched the Apache RTR 180 in 2009. The RTR 180 gave the Pulsar 180 a good run for its money with TVS putting the 180 in its racing programmes. It was also the first motorcycle in India to get dual-channel ABS. Ten years down and thanks to their partnership with BMW Motorrad, TVS has the Apache RR 310 in their line-up. The RR 310 too has been put into their racing efforts. The RR 310 Cup featured only champion racers as TVS wanted to keep the levels of competitiveness as high as possible. Although Yamaha has dabbled with econo-centric motorcycles and scooters in India, there is no doubt that their most highly revered motorcycle continues to be the R15. The first gen was a revolution of sorts as it was India’s first modern engined motorcycle with supersport dynamics. It made the rider instantly feel like Rossi, and even ten years down the road the R15 v3.0 evokes the same feeling. However, there is a larger sibling to the R15 in India now, the YZF-R3, which has a parallel-twin heart and a beautiful chassis. In 2018, it got ABS as well as sticky Metzeler rubber. Perhaps 2019 would spell the launch of the next gen R3 in India, which has got USD forks and uprated KYB monoshock. 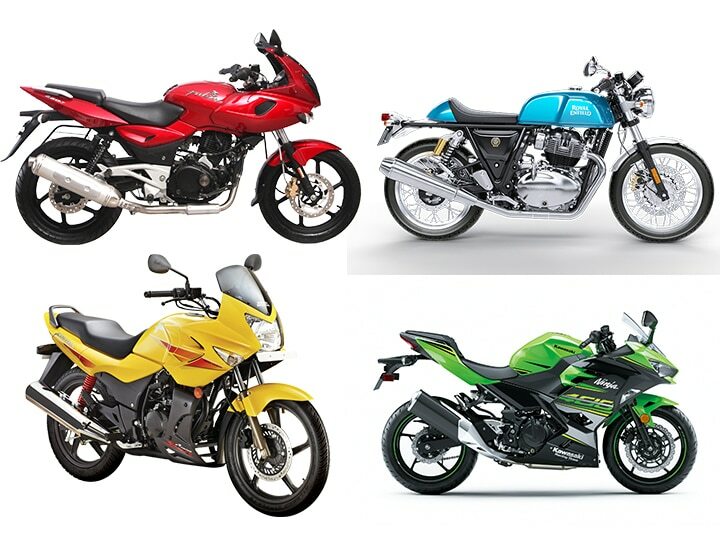 Unlike other brands on this list, Suzuki’s best affordable motorcycle remains a 150cc motorcycle, making it the least powerful bike here. They had the GS 150R, a unique motorcycle in its own as it had a six-speed transmission. And while that was great news for econo-centric riding, the motorcycle lacked excitement. They got the Gixxer in 2014 (and its fully faired sibling, the Gixxer SF, a little later) and that turned out to be a masterstroke. The naked continued to be the benchmark in its segment until the TVS Apache RTR 160 4V came about. Yet the Gixxer SF remains one of the easiest ways one could get their hands on a fully-faired motorcycle. And a damn good one at it. Hyosung is one brand that has had a tumultuous time in India. They were first introduced in 2004 by Kinetic Motors (now the main driving force behind MotoRoyale) with the naked Comet. For the next eight years, they were out of action until Garware Motors decided to re-introduce the brand once again to India with the fully-faired version of the Comet - the GT250R. The very same bike continues to be made available to the Indian masses, despite the brand’s partners changing to DSK Motowheels and now back with Kinetic’s MotoRoyale. India got its first taste of a modern free-revving liquid-cooled parallel-twin motor thanks to Kawasaki’s Ninja 250R. The motorcycle was well known in international markets as the perfect beginner’s bike. But here in India, it was a game changer for us, an eye-opener of sorts as the performance was far beyond anything imaginable at the time. Now though, they have two sub-400cc offerings of which the locally-sourced Ninja 300 is the cheaper and, more aptly, slower option. The perfect Ninja though has to be the Ninja 400 as it has the wherewithals to beat the KTM RC 390 at its own game, making it perhaps the undisputed king of its class. Shame it has an eye-watering price tag. Barring a sparing few, Indians had never heard of an Austrian brand whose motto was ‘Ready To Race.’ But KTM has gone from being non-existent to being the first name when it comes to performance motorcycles in India. The Orange fever didn’t hit our shores until 2012 when we first got a taste of the 200 Duke and were blown away by it. In a short time frame of seven years, KTM has four naked and two supersport offerings with an entry-level adventure tourer (390 Adventure) and a mid-capacity naked (790 Duke) on the cards for 2019. Their best product remains the 390 Duke which received a generation update in 2017, which made it racier than ever.